Before we can tackle climate change, financial reform, education reform or, well, anything, there is a single issue that we in the United States must confront. As legal activist Lawrence Lessig says in today’s talk, before we can bring about change on any of the thousands of issues that matter to us, we must change a central corruption at the root of the American political system — that politicians must raise vast amounts of money in order to have a chance in the general election. This makes them prone to the influence of a very small percentage of the population. 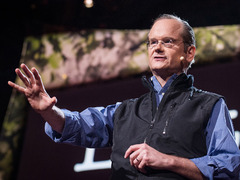 Lessig’s powerful talk brought the TED2013 audience to its feet. And he has so much more to say about how we can overturn this deeply entrenched system. In a TED first, on the same day his talk premieres, Lessig is releasing a new TED Book expanding on the ideas he presented on stage. In Lesterland: The Corruption of Congress and How To End It, Lessig takes on the deep flaws in our campaign finance system and lays out a plan for fixing it. As he says in the book’s pages: The American political system has been weakened by a corrupt campaign funding system, but we can change it. And the time to do it is now. Lesters in Lesterland had a very important power. There were two elections every election cycle in Lesterland — a general election, and a “Lester election.” In the general election, all citizens got to vote. In the Lester election, only the “Lesters” got to vote. But here’s the catch: To run in the general election, you had to do extremely well in the Lester election. You didn’t necessarily have to win, but you had to do extremely well. Democracy in Lesterland was thus a two-step dance. The Lesters controlled the first step. What can we say about “democracy” in Lesterland? First, we could say, as the United States Supreme Court said in its remarkable ruling in Citizens United v. FEC, that “the people have the ultimate influence over elected officials” — for, after all, there is a general election. But the people have that influence only after the Lesters have had their way with the candidates who wish to run in that general election. The people’s influence is ultimate. But it is not exclusive. Instead, the field of possible candidates has been narrowed to the field of Lester-plausible candidates, just as the field of candidates that citizens in the Soviet Union could select among had been narrowed by the choices of the Communist Party. Second, and obviously, this primary dependence upon the Lesters would produce a subtle, understated, and somewhat camouflaged bending to keep the Lesters happy. For all candidates, both prospective and already successful, would know that they couldn’t gain or retain power without Lester support. Such bending couldn’t be too obvious, for fear it would trigger the votes of voters who resented the Lesters’ influence. (No doubt, there were some.) But neither could it be too subtle, for fear the Lesters would miss who their real allies were. Thus the Goldilocks principle of Lesterland politics: Not too little, and not too much. The best politicians were the best precisely because they practiced this balance well. Lesterland is thus a democracy. But it is a democracy with two dependences: The first is a dependence upon the Lesters. The second is a dependence upon the citizens. Competing dependences, possibly conflicting dependences, depending upon who the Lesters are. (1) The United States is Lesterland. Like Lesterland, the United States also has 311 million souls. It also has about 150,000 people named “Lester.” And it also has two types of elections: One, the traditional “voting election,” where citizens cast ballots. The other, a distinctively modern “money election,” in which the relevant “funders” give money to afford candidates the chance to run effectively. Voting elections are discrete — they happen on a particular day, in a regular cycle. They include the vote in the general election; for a small portion of us, they also include the vote in the primary. In both cases, every citizen eighteen and older has the right to participate. And as the constitution has been interpreted, he or she has the right to participate equally. If the vote I cast for my representative to Congress is weighted more than yours (because there are fewer voters in my district than in yours), the Constitution requires the state to redraw that congressional boundary. By contrast, the money elections are not discrete. They are continuous. Every day, throughout the election cycle, every citizen is in effect asked to contribute to one candidate or to another. That contribution is in effect a “vote” for that one candidate or the other. But unlike “votes” in the discrete elections, to vote for one candidate in the money election does not mean you can’t vote for another as well. Citizens are free to hedge their money votes in the money election by voting for both candidates in a two-person race, or as many candidates in as many races as they wish. The only regulation is that no citizen is permitted to give more than $2,600 to any one federal candidate per election, or more than $123,200 to all federal candidates and federal PACs combined in an election cycle. And finally, and obviously, while the Constitution has been interpreted to require equality in the voting election, there is nothing close to equality in the money election. The per capita influence of the top 1 percent of American voters is more than 10 times the per capita influence of the bottom 99 percent. And here is the key to the link between Lesterland and the United States: There are just as few relevant “Funders” in U.S.A.-land as there are “Lesters” in Lesterland. Read more of this fascinating and, ultimately, inspiring book. Lesterland is available for Kindle and Nook, as well as through the iBookstore. Or download the TED Books app for your iPad or iPhone. Political parties (as well as a media that has broken from its mooring of journalistic integrity), similar to funders, both also filter (&/or bias) the choices available to the voting public. It cost all of $3 so I bought it and had it sent to your kindle.